Your commercial or industrial property is the heartbeat of your enterprise. It is your most valuable asset and your ability to generate profit depends on it staying safe. Fencing is the oldest, most basic and most effective form of keeping a property safe. Some of the world’s most famous structures such as The Great Wall of China have been designed to provide what a fence does and that is keeping those inside the fence safe by keeping everything else out. Your property probably wont need something as comprehensive as The Great Wall of China but it still needs an effective fencing system that will keep it safe and allow you to regulate what get in and out. When deciding on your commercial or industrial fencing option you need to take into account exactly what you’re trying to achieve. 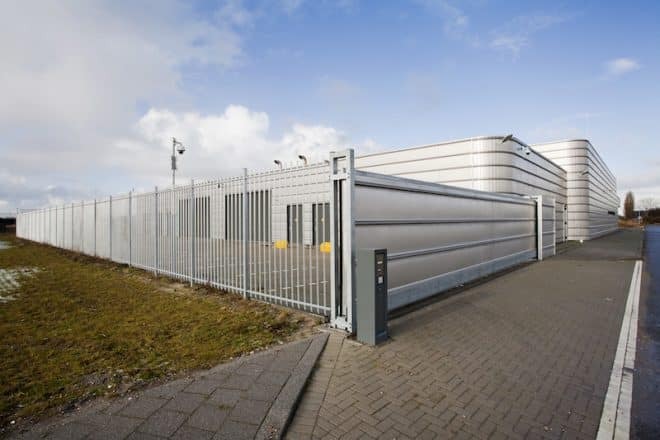 All of these options can be used effectively in an industrial or commercial setting, so it all comes down to what you need out of your fencing. If you want something that can provide security as well as being aesthetically pleasing you need to look for an option that looks good and is strong at the same time. Aluminium slat and Colorbond are probably your best options for these purposes. Colorbond looks fantastic and because there are no cross beams involved it is impossible to climb over. Aluminium slat fencing provides a beautiful, natural look and if the slats are placed together it will also be very hard to climb over. You can also rely on both of these materials to stand the test of time. Steel fencing is perfect for those who want security but don’t want to opt for the full security fencing option. Steel fences last forever and the addition of pickets or spears to a steel fence can add a visual element and a further deterrent for intruders. If a steel look doesn’t quite suit your property you can always turn to a wood picket option, if these are made high enough they can still provide effective security for your property. If you’re looking for a basic, effective and low-cost security option for your property there is nothing better than a humble security fence. Chainlink or chainmesh is impossible to climb over or under and you can even top it off with some razor wire or spiked tops to make your property completely impregnable. How Do I Make the Final Choice? Making choices is about weighing up all the factors and then prioritising. If aesthetics is more important than cost you can consider the Colorbond or Aluminium Slat option. If you’re looking for a low-cost but effective option a chainlink or chainmesh option is probably best suited for your needs. Chainlink and chainmesh fences are perfect for those looking to save money. They are resistant to corrosion meaning they will last and if anything does happen they are incredibly easy to repair. All you need to do is repair the section that has been damaged instead of getting a whole new fence. You need to look for fencing materials and contractors that will provide you with the highest quality. Your fencing contractor should be able to look at your property and devise a fencing solution that will keep it safe. That means they will know how high the fence should be and how far underground it should reach. They will know how to space steel and aluminium fencing options to make them un-scalable. Quality of materials is also incredibly important. If you want to protect your property don’t skimp and go for poor quality steel. You need strong; durable steel that can stand up to forced entries. There’s no point having a fence if someone can get through it with a pair of pliers. If you look for quality in both your contractor and your supplier you will save money in the long run. A steel, aluminium or security fence should last the lifetime of your property if it is installed correctly and constructed out of the highest quality materials. Know you have all the information you need to make an informed decision on how to create the perfect fencing solution to suit your commercial or industrial property. The experts at Everlast Services can provide you with all of the information you need on keeping your property safe and keep costs down.